So, it’s been almost 7 years of children in the house. They really did a number on my seat cushions, but they weren’t destroyed or anything. Since the youngest is 3 years old, I thought it might be time to redo the cushions. Instead of buying a whole new dining set, of course. This was WAY cheaper. I spent a total of $22.50* to redo all 6 chairs – or $3.50 per chair. Or, even if you don’t have kids and want to change up your colors – this is a great, fast and easy and cheap way to do it! With the holidays coming up and people coming over, this will be a good change. The first step is to pick your fabric. 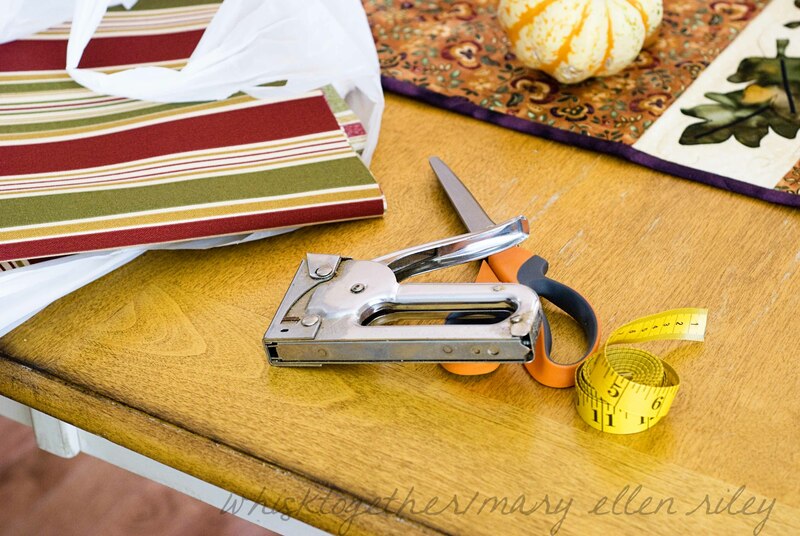 A good fabric store and cutter should know how much fabric you need. 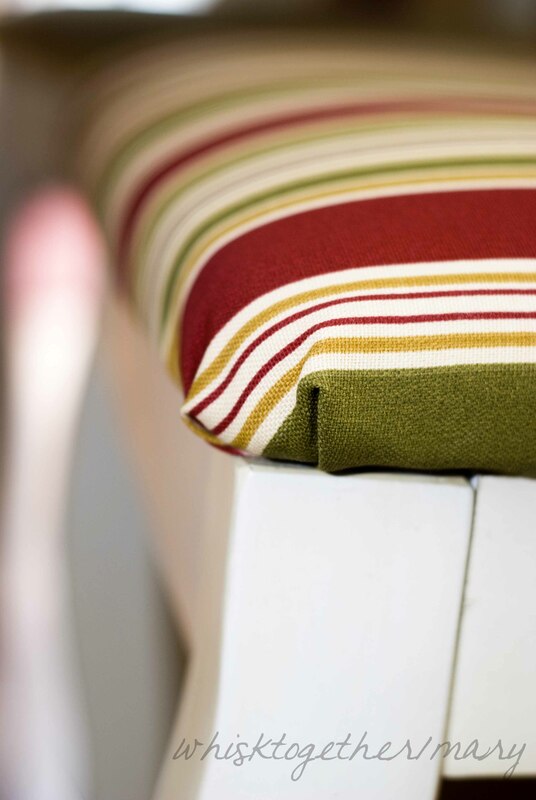 For a standard chair, you need 3/4 of a yard of 50″ outdoor fabric for every two chairs. My chairs are pretty standard and measure 17″ by 20″. Therefore, I need 23″ by 26″ of fabric for each cover. Always just add 6″ to the width and height. The depth of my chairs was about an inch… again pretty standard, so 6″ extra was plenty. Why outdoor fabric? Well, you can cover your chairs with blue jeans, drama t-shirts (I have NO shortage of those!) or cotton or anything really. 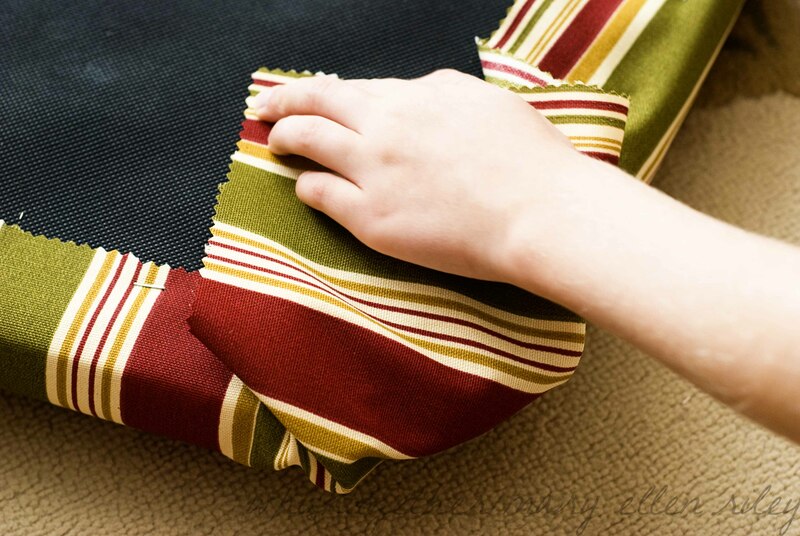 However, outdoor fabric is already treated to be stain, mold and mildew resistant. Food falls right off and food stains wipe right up – believe me. The kids gave me plenty of testing. 🙂 I finished all 6 chairs in about 2-2 and 1/2 hours. The longest part is taking the screws out of the bottom and putting them back in. 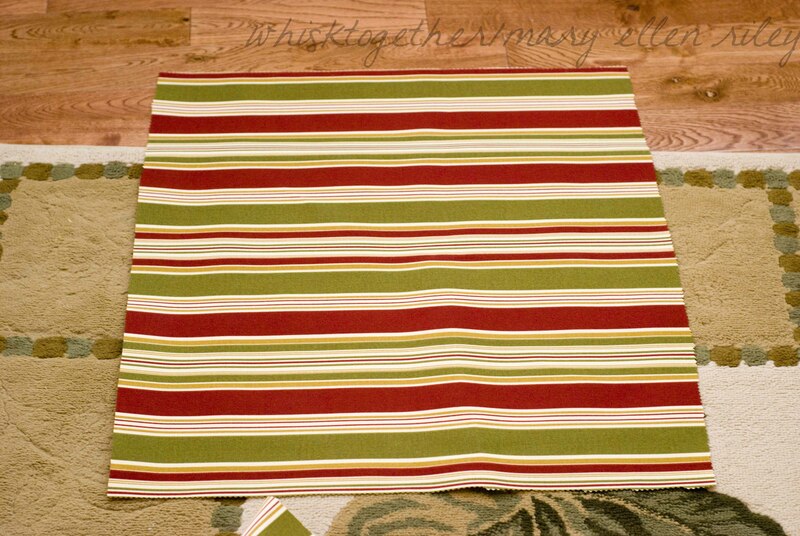 *I purchased the fabric from Joann’s which almost always has Outdoor Fabric at 50% off . Regularly it is $19.99 for most prints. It is $9.99 per yard on sale. 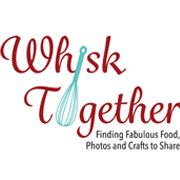 If you sign up to be on their mailing list or use their app, you can get 15% or 10% off your total purchases – even sale purchases – as well. 1. Obtain your fabric. See above for my opinion on what to pick. Remove your seat from the dining chair. For me, this involved unscrewing 6 screws. 2. 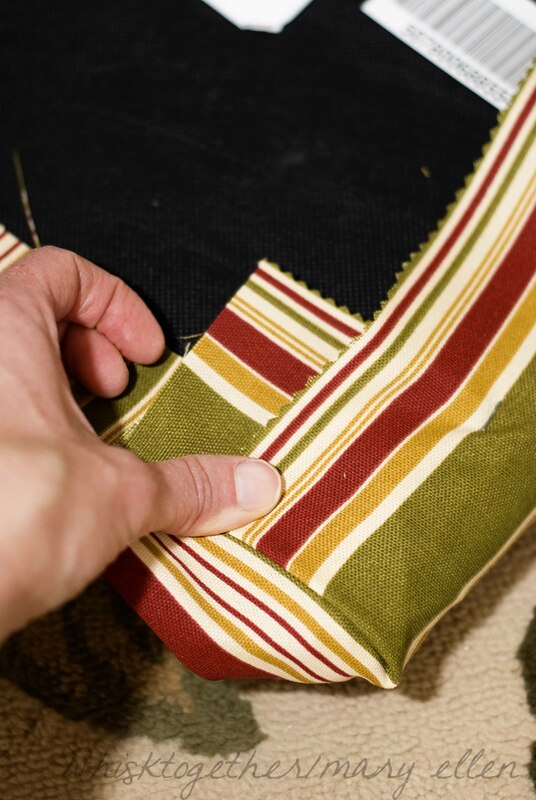 Cut a square that is 6″ wider and longer than the actual seat cushion. For me, my cushion was 17″ long by 20″ wide. Therefore, I cut squares that were 23″ by 26″. 3. 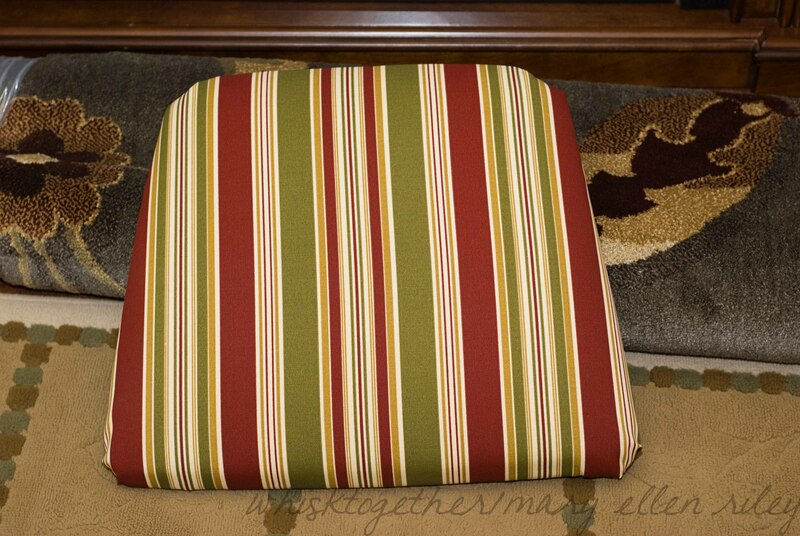 Lay your seat cushion on top of the fabric like in the photo. 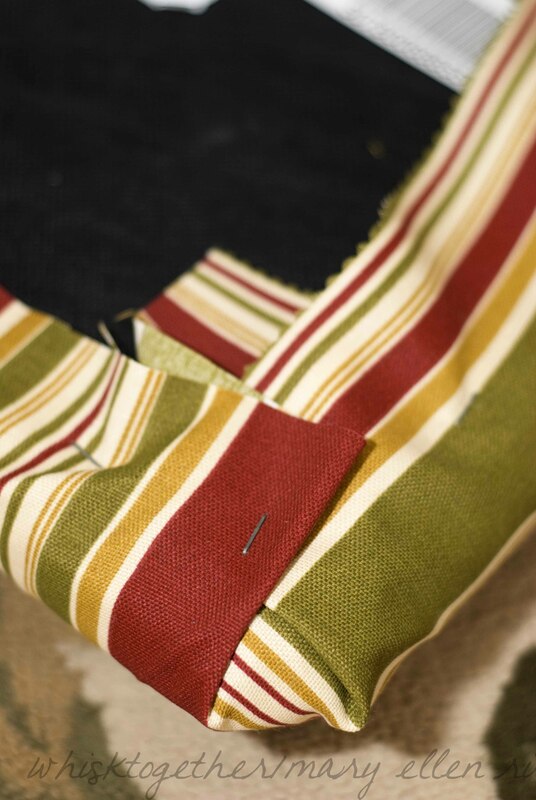 Pay special attention to the fabric if it is something like stripes. You want to make sure they are lined up straight. 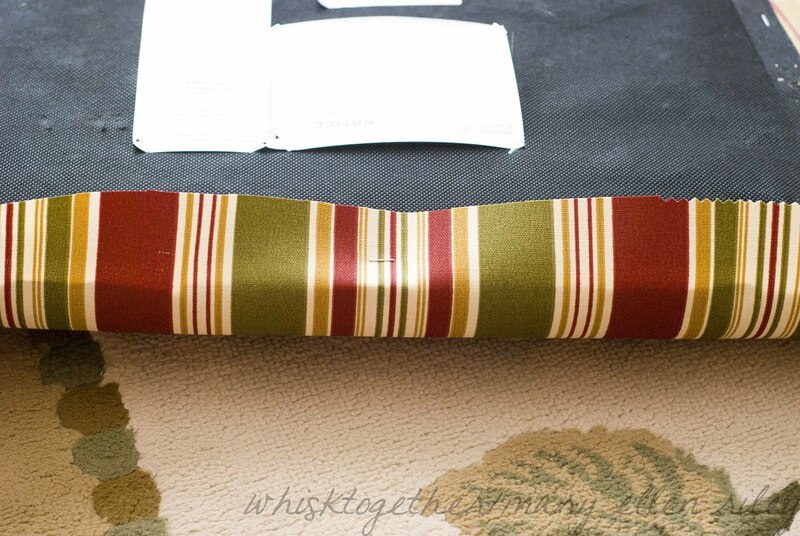 Wrap two sides around to make sure they will fit snugly. You want to pull it tight – but not so tight that it pulls the fabric’s design out of place. (e.g. your stripes are not straight because you are pulling too tight on the fabric.) You are covering the seat UNLESS your seat has huge rips, smells bad because of something soaking in, etc. Mine had none of those issues, so I covered them instead. 4. Place 1 staple in the center of one edge. 5. Continue to staple outwards along this edge. Don’t get too close to the corners. Leave about 2″ at least on either side away from the corners. 6. 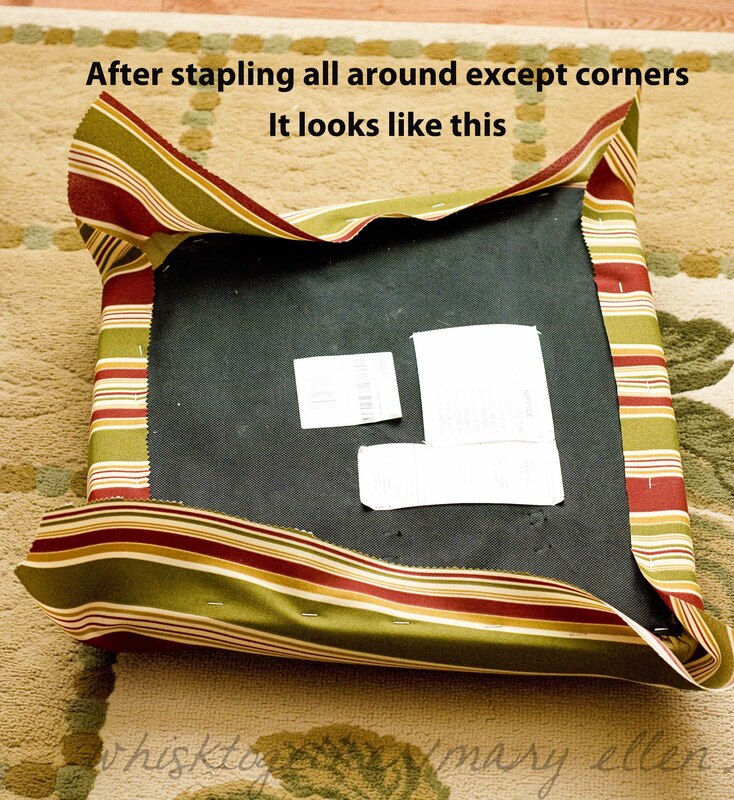 Move to the other side of the cushion and staple the same way on the OPPOSITE side of where you just stapled. Repeat this stapling for the other two opposite sides. 7. 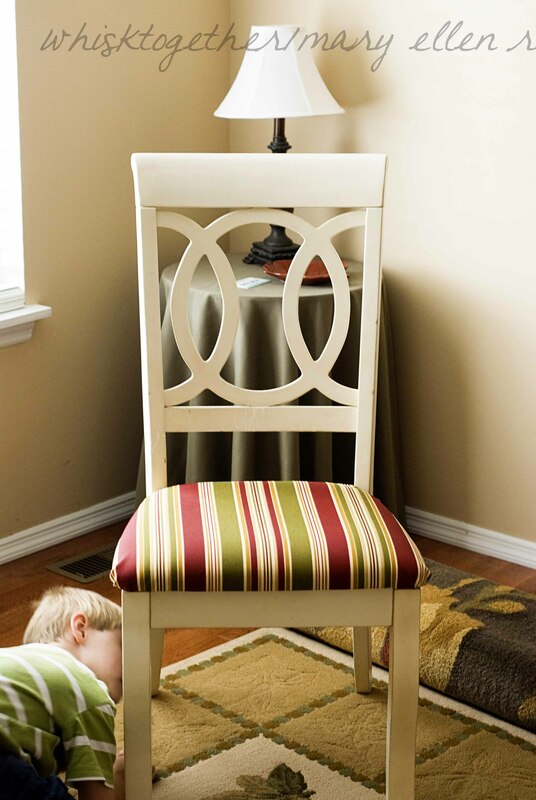 Now corners can be a little tricky, but with a little patience they will look just fine. 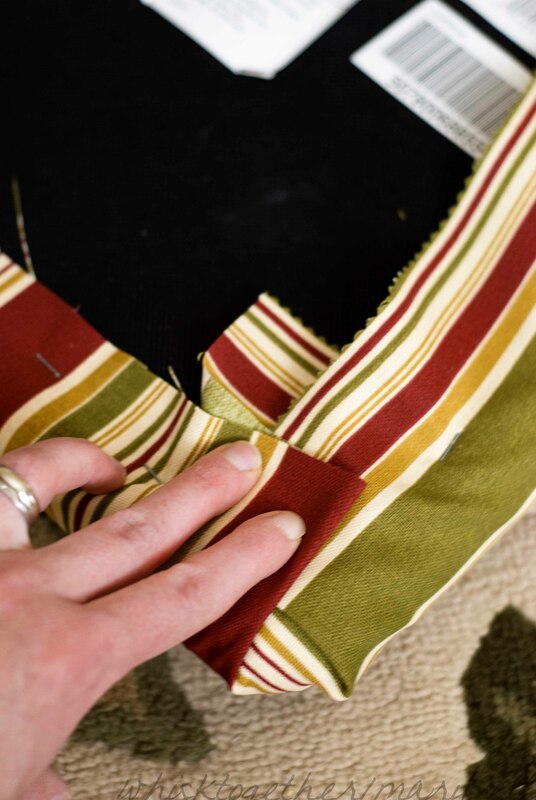 First, grip the corner of the fabric and fold it onto the cushion. 8. Next, take one of the corners and fold it towards the middle. 9. Take the other corner and fold it towards the middle as well. It doesn’t matter which order you go in. Though it seemed to me that one way always looked better than the other way. So, I just tried both sometimes until I got it looking right. 10. You may want to flip the cushion over to see if it looks nice on the other side. If so, staple that down! If not, try folding it starting with another corner first and see how that looks. I usually used 4-5 staples on the corner. 11. At this point, you are finished once you finish all 4 corners. You may trim your extra fabric off if you like. 12. 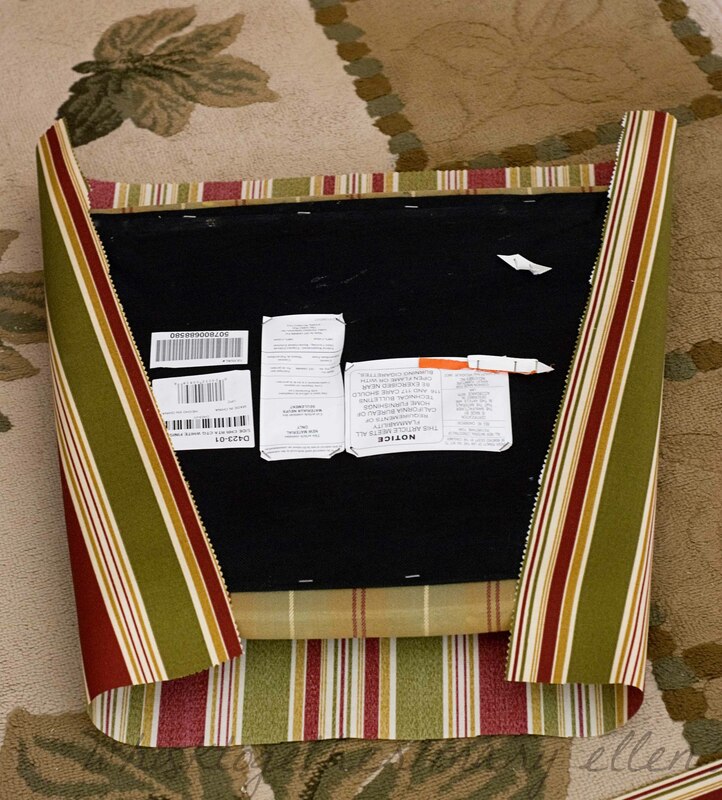 Flip your beautiful new cushion over! 13. 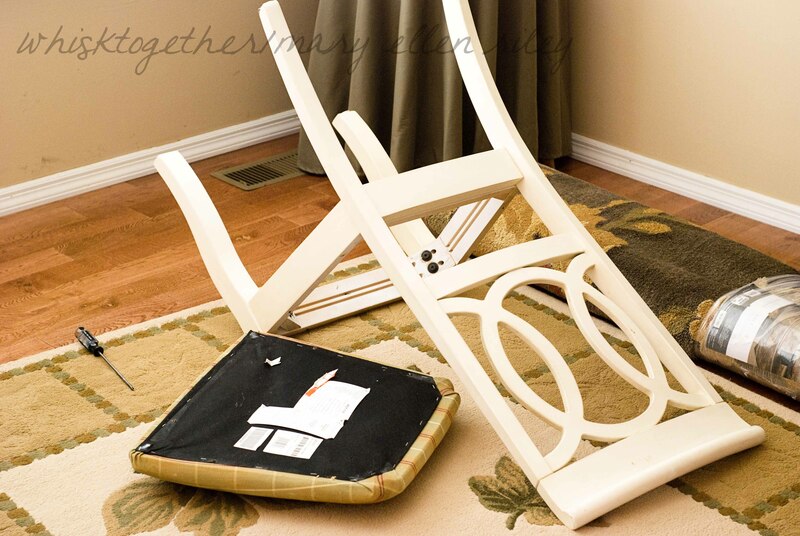 Attach it to the chair. Marvel in the chair while it is still clean for 5 minutes. Tell child to please get out of the photos. Etc. Etc. Glad someone could make this look so easy and non-intimidating! Thanks for this! Love the website and the prices! Wow, those beat Joann’s any day. No problem about the tutorial. I attest that outdoor fabrics really aren’t just for the outdoors.